Shade-loving patio plants add color and textural interest to outdoor living spaces. Container-grown plants often require frequent watering, especially during hot weather. Choose healthy plants available from reputable garden centers or nurseries, and incorporate a wide variety of container types into your patio, such as window or rail boxes, decorative urns and hanging baskets. Use vertical as well as horizontal space to draw attention to otherwise bland areas. Wishbone flower (Torenia fournieri) is a perennial often grown as an annual landscape plant. It is a good choice for containers and hanging baskets located in shade or semi-shade locations. Wishbone flowers are attractive, showy plants with a trailing habit and grow up to 1 1/2 feet tall and spread up to 1 1/2 feet. Dense foliage contains prolific pink, blue-purple or white blooms. Grow Torenia in partly shaded patios in various well-drained soils. Grow oak-leaf hydrangeas (Hydrangea quercifolia) in partial to fairly deep shade in nutrient-rich, acidic, well-drained soils. Pee Wee and Sikes Dwarf are common dwarf cultivars good for shaded patios and small gardens. Although considered dwarf cultivars, these reach 4 to 6 feet in height and require large pots if container-grown. Alternatively, grow hydrangeas in the ground along patio and porch edges as foundation plantings. Grow oak-leaf hydrangeas in USDA Zones 5 through 9. Impatiens (Impatiens walleriana) is a spreading, branching annual. Its size varies by cultivar, ranging from 8 to 36 inches tall with a rapid growth rate. 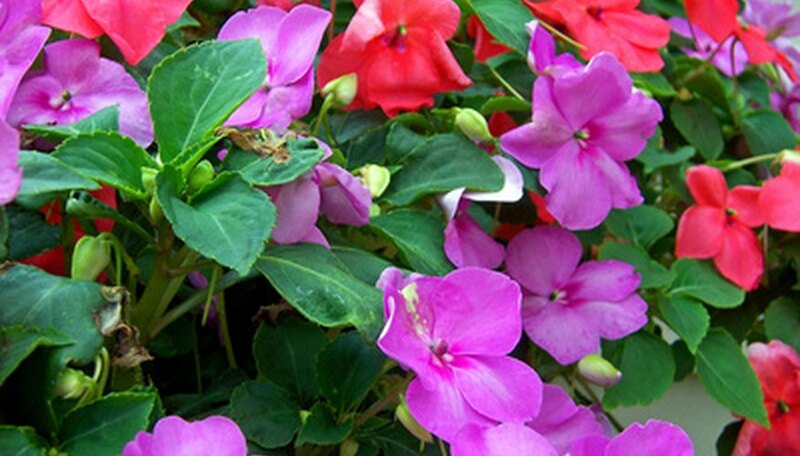 Impatiens flowers are up to 2 ½ inches across, in many colors: purple, white, yellow, red, orange or variegated. Grow impatiens in part-shade to full shade in moist, well-drained soil. Impatiens do not tolerate frost. Fuchsia x hybrida, commonly known as ladies' eardrops, is well-suited to hanging baskets or containers in locations receiving morning sun and afternoon shade. Fuchsias do not tolerate hot afternoon sun. Fuchsia flowers are pendulous and bell-shaped and range in color from white, pink, red, magenta or purple. Some fuchsia flowers are bicolor, depending on the cultivar. Grow as an annual container plant in cold climates or as a perennial in Zones 8 through 11. Fuchsia magellanica is suitable for Zones 7 through 10. Grow wax begonias (Begonia x semperflorens) in planter boxes or hanging baskets in shady patio locations. Leaf color depends on cultivar, ranging from green to bronze-red or mahogany-red, or green variegated with white. Wax begonias bloom all summer with clusters of white, pink, red or salmon flowers. Height and width of wax begonias vary with cultivar. Wax begonias are hardy only in Zones 10 through 11 and need protection from winter frosts.